This Good Dog, Bad Zombie review was made after playing the game six times. We were sent a copy of this game by the publisher in exchange for an honest review. What is Good Dog, Bad Zombie? 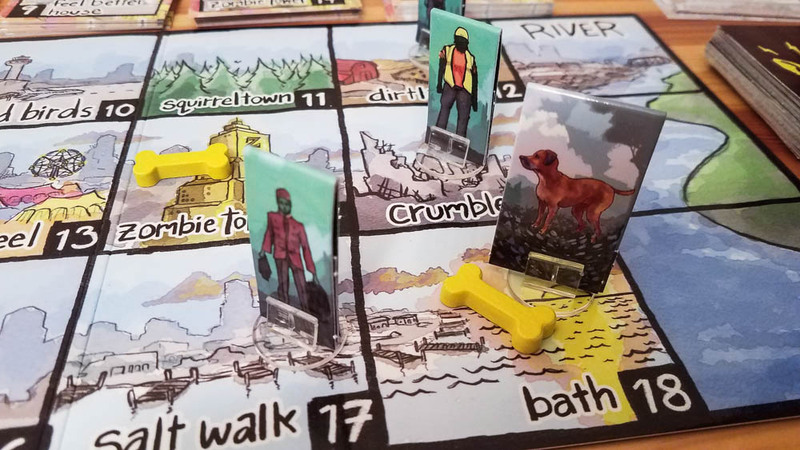 Good Dog, Bad Zombie is a cooperative board game in which you play as a group of dogs attempting to save some humans during a zombie apocalypse. The game was designed by Evan Rowland and Brian Van Slyke and it’s published by Make Big Things. In Good Dog, Bad Zombie, you and your teammates will be playing as dogs that are moving around the city, killing some zombies, and rescuing some humans. If you’re unable to save enough humans, the dogs will become feral and you’ll lose the game. Run 1 – Move one space in any direction. Lick – Licking allows you or someone else in your space to draw two energy cards (more on those below). Sniff – This is how you find the humans. You’ll sniff in a space with a bone, place a human on your space, and then read the Scent card that matches the space you’re on. Play Energy Card – Energy cards allow you to perform better actions that will help you get humans to safety and kill zombies. 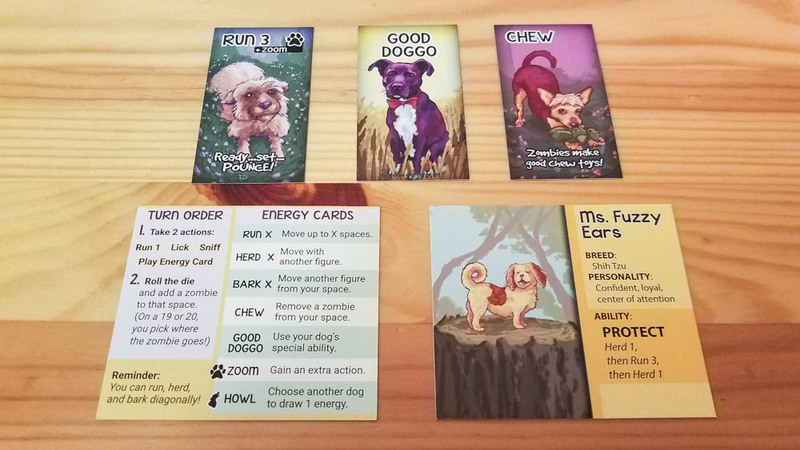 With these cards you can move extra spaces, herd or bark at humans and zombies to move them around, chew on zombies, gain extra actions, howl to give other players energy cards, and you can get Good Doggo cards that activate your dog’s special ability. To save a human, you need to herd and/or bark them to one of the three central spaces at Central Bark. You’ll gain a Hooman card every time you save a human, giving you a one-time-use special ability such as removing a zombie or drawing an energy card. After every turn, you’ll roll the die to see where the next zombie will show up in the city. If a zombie already occupies that space, the new zombie will be placed in the next space towards Central Bark. If a human is in that space, the human is eaten and is removed from the board. If a zombie is placed on a space with your dog, the dog is startled and you have to discard two energy cards and move to Central Bark. You’ll lose the game if the Feral Track ever reaches 10. You move the marker forward on the track when zombies make it to Central Bark, when humans get eaten, and every time you can’t discard an energy card when you need to. To win, you need to save a certain number of humans (six at medium difficulty) and then every dog needs to make it back to Central Bark. You can pull off some pretty cool combos in Good Dog, Bad Zombie if you get the right cards in your hands. For example, you could bark a zombie off of a cliff, then run over to a human, then herd him over to Central Bark. I like that the Good Doggo cards are needed to activate a dog’s special ability rather than it being a once-per-turn ability. It makes the abilities feel that much more important and it forces you to think about how to get the most out of them. This is a goofy theme that most people can get into. I’m not a big fan of zombies, but I do like working together to make sure those dogs don’t end up all on their own. This is a very easy game to learn how to play. You can teach it as you play and most people will understand all of the rules by their second or third turns. Most of our games have gone down to the wire so far. Medium difficulty is going to be perfectly challenging for most groups. I really like the dog art on the cards and the cover art. I crack up every time I look at that little dog on the cover going in for his finishing move. Rolling the die to place zombies makes sense thematically since you’re not supposed to know where the zombies are going to show up, but you definitely can get very unlucky with it. We had one game where the zombie randomly showed up in one of our dog’s spots four turns in a row, forcing us to lose energy cards and go way up on the Feral Track. The board looks really strange to me. I wish the artist had found a way to make the Cliffs, River, and Central Bark sections blend with their surrounding images a bit better. The cards are very thin. I feel like I have to be extra careful with them to keep them from getting creased. The standees were a pain to put together. A couple of them tore when I was trying to put them in their stands. I have to be honest, I didn’t expect my group to enjoy Good Dog, Bad Zombie as much as we have. It plays very smoothly, it has a fun theme, and it gives players interesting decisions to make on their turns thanks to those energy cards. It has a similar feel to a lot of other light co-ops, but the theme helps to make it stand on its own. I’d love to see a new edition made at some point with higher quality components, a nicer-looking board, and a couple more Scent cards for each location, but I will be holding on to this version since it has gone over so well with everyone I’ve played it with. 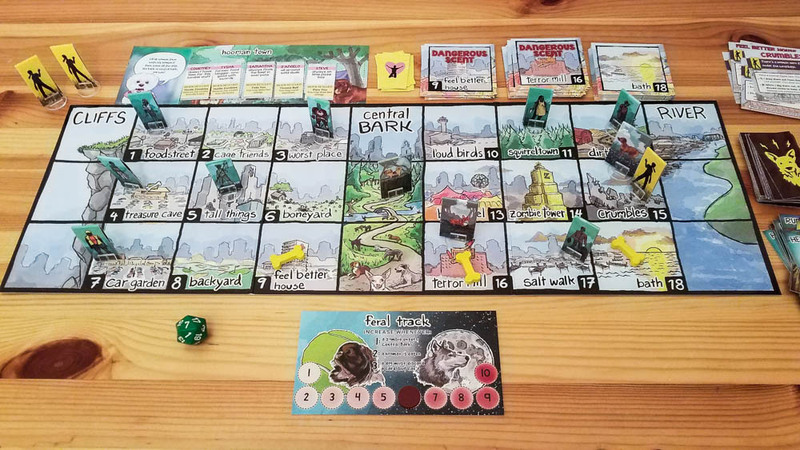 If you’re looking for a gateway game, a co-op family game, and/or a board game about dogs, I do recommend checking out Good Dog, Bad Zombie. My group also had a chance to play the Weird Smells expansion, which makes Good Dog, Bad Zombie a bit more of a gamer’s game. It adds in missions and a powerful zombie slayer, giving players more to think about each turn. It’s a very solid expansion. 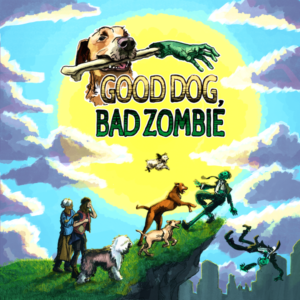 Thanks for taking the time to read our Good Dog, Bad Zombie review! To stay updated on all things cooperative board games, follow us on Twitter, Facebook, or via RSS.